This operation is often used and may be applied to make a simple change of scenes or even a full slide-show. Our video editor has an embedded "Wizard" which will help you to easily make these scenes. Besides the program allows to automatically create transition effects between scenes on the basis of pre-installed templates. So let’s review in details procedure of making slide-shows. 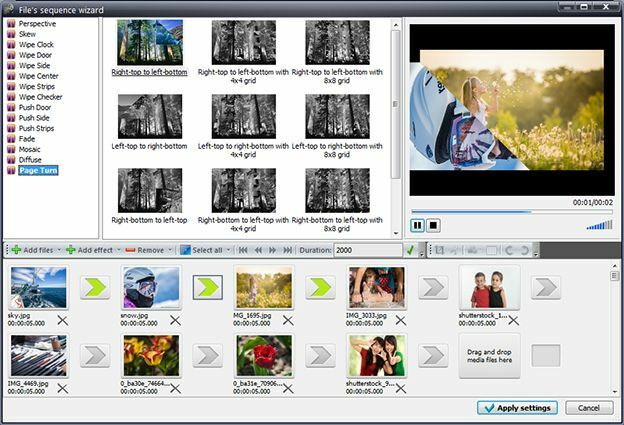 We can see four regions here: a list of transition effect types between scenes, transition effects of the selected type, video player which displays the selected effects or video, and a region with a list of files used for making a slide-show. You can remove or change sequence of files using several buttons on a toolbar. You can change order by dragging a file and dropping it on a new position. P.S. To see effects again you need to mark an intended effect. Duration of image is automatically set for five seconds. But it can be changed. For this purpose mark a file in the list, amend its duration in a toolbar and click "Apply". 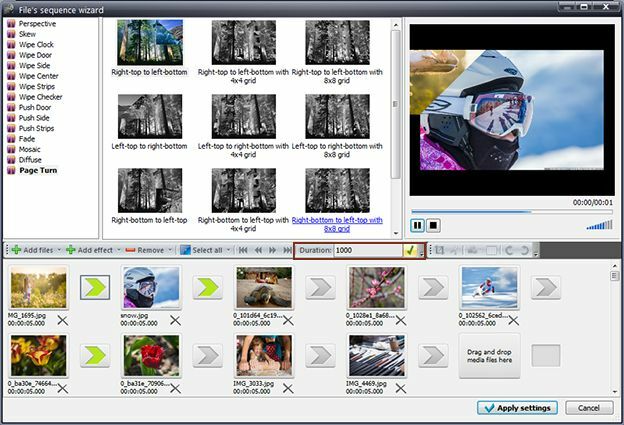 You may also remove borders, fragments in video or split video into parts (for example, to make a transition effect between separate scenes of video). You can do it using menu which will be open when you make a double click on an image. You will also see additional settings windows which were reviewed in sections "How to split a file into parts", "How to cut an unwanted fragment from video" and "How to crop borders in video or image". In order to see how the effect will be performed you need to mark it, and the player will automatically show this effect. P.S. Player automatically plays video upon a click on any object: on an effect in the list of effects, on a file, on an effect applied to files. You can delete effect through a toolbar or a menu. After you set sequence of files and added transition effects you need to click "Apply settings". As a result a sprite will be added to the scene (sprite is an object consisted of other objects) which consists of all files which we added and of the necessary effects. 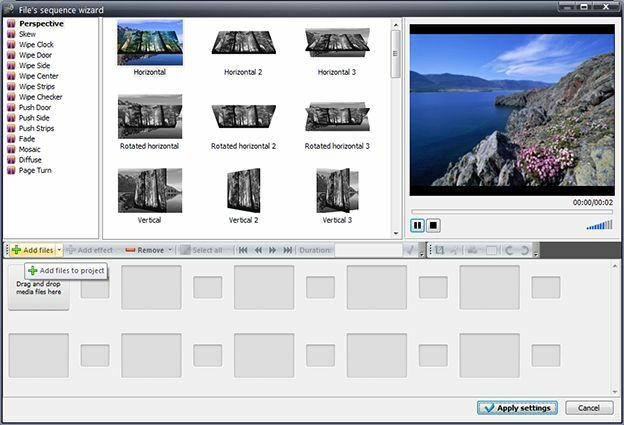 In order to make a result video you need to export project to any of available formats. All trademarks referenced herein are the sole property of their respective owners. Copying any materials from this site allowed only with written consent of Site Administration.